The allotment is giving up the last of her goodies but there is still stuff going on, I put the garlic in last weekend and it already putting shoots out. I’m not sure whether to grow it in the greenhouse or outside. Garlic is hardy and the rule of thumb is to plant on the shortest day (Dec 21st) and harvest on the longest day (June 21st) so it will survive frost and snow. I will put some in the greenhouse as a comparison and see how it woks out as I intend to cover my plot again this year. While clearing the plot this week I noticed three new cucumbers, I though I had seen the last of these. I have moved them to the inside of the netting to stop the foxes having a snack. My medlars are looking ready and during this weeks high winds a couple were blown from the tree, but the rest still feel pretty attached so I am resisting the urge to pick them. They are normally ready in October/November but due to the very hot summer they may ripen earlier, just like most of the other fruit and veg. My daughter and her boyfriend have recently bought a French bulldog pup which they have named Freddie. I am not into small dogs but I will make an exception with this chap. He has absolutely no fear and is the most confident pup I have ever come across. When they visit he walks around my house like he owns the place, much to the consternation of Alfie (My 6 year old chocolate Labrador). Alfie isn’t good with puppies so barks at him a bit but it doesn’t put Freddie off at all even when he is running from Alf after pinching one of his favourite toys. My daughter and her boyfriend are now going through the pain of house training, something I don’t envy. That said, I have been really lucky with dogs, my last two have picked it up really quickly. The O’s are really on fire at the moment and we are currently unbeaten this season and sit at the top of the Vanarama league. Its now been 18 months since the mad Italian (Francesco Becchetti) cut us loose with just eight players three weeks before the start of the season and we seem to have turned a corner. Last season was a real eye opener, the national league really is different type of football. It also goes without saying that the refereeing is equally poor. We struggled last season but this season we are certainly looking like promotion candidates subject to a disaster. Probably the only thing I like about this league is the proximity of the away games, they are quite easy to get to as many of the clubs are in the south east. Braintree Tuesday evening! Last week I travelled to Northern Ireland for a meeting back at the factory, I was an eye opener for me because over the past couple of months the factory has been moved to a new site across the road into the old tobacco factory. It is really modern compared to the old site. The old factory grew organically and tended to be a pick scattered, whereas the new site now has a flow to it. The worst part about the trip was the fight into Aldergrove just as storm Allie turned up. The landings at Aldergrove can be interesting due to crosswinds at the best of times but this time was probably about the hairiest I have had. My employer Wrightbus, have just announced another 95 redundancies, or should I say the start of a consultation process to make 95 members of staff redundant. We are only just getting over the previous redundancy announcement. Things are going to get very interesting over the next 6-9 months. Wirght’s like the other UK bus builders are feeling the pinch after recent reports showed a marked downturn in passenger number over the past couple of years. The situation is different to the provinces where the routes rely on passenger revenue, in London, routes are controlled by TfL and are allocated on a pence per mile basis, so passenger numbers don’t normally mean that much to the operators, however TfL holds the purse strings and they have some major budget restrictions. I’m not sure where I will be in twelve months time, but whatever happens it’s going to be interesting. The plots are both looking well and Lesley has surpassed herself with her plot. She really has a knack for gardening, something that surprised us both. Everything that needs to be in the ground is planted with my runner beans being the last sees to plant, which I did today. I still have some serious weed problems on the top half of my plot, with bindweed and the dreaded mare’s tail. Mare’s tail is almost impossible to resolve as the root can be over two metres below the surface. Our Strawberries are ripening now and we have already had a few bowlfuls so far. I also have quite a few blackcurrant bushes which are in fruit at the moment and the berries are darkening daily. Not much else to say today, more next time. Hedgehogs, I was speaking to one of the plot holders the other day about the distinct lack of hedgehogs on the site. He was telling me there were a few pairs on the site up until about 4 years ago. The site manager at the time had a real thing about order and tidiness and got rid of all the hedges and any rough patches we had. The hedgehogs were never seen again. With this in mind I contacted an Essex rescue centre and had a chat with them about rehoming any of their hogs. The lady was really keen but after some discussion it became apparent that due to the use of pesticides and slug pellets they cannot leave any hogs at our allotment. I was gutted about this, but fully understand. I’m now wondering how much the depletion of the hedges had to do with the disappearance of the hedgehogs , more likely the use of pesticides and slug pellets. I don’t use pesticides but most of the other plot holders do. My butternut squashes are really growing now and have gained around five inches in a week. We are going to have people queuing up for them when they are ready. One of my courgettes is still putting fruits, but I don’t know how much longer for. One has stopped now but the other is a monster. I have harvested my pippins, and they are extremely tasty. I have a blackthorn bush behind my plot and now cant wait for the sloes to ripen so that I can make some sloe gin, we’ll see how that works out. This week I will be planting parsnips & chard. I have some red onions for when the potatoes come up and I got some daffodil and tulip bulbs for planting under the fruit trees. Daffs are Lesley’s favourite flowers so I should get some brownie points for this. I will plant some green manure also for the winter, this is a plant that is used to condition the soil, the other guys on the plot have never heard of it but that won’t stop me. The consultancy I am doing for the Chinese Organisation is coming to an end, I have about three days work left to do over the next couple of weeks, I will even be receiving a bonus for my efforts, which isn’t necessary considering the hourly rate they are paying me. It got me to thinking about when I started work in this industry in 1977, I was paid 40p per hour, and the Chinese are paying me more an hour than I earned a month when I first started work. It’s funny how it all works out in the end, I am eternally thankful to my old man and my brother Pat for pushing me when I was younger to get qualified. I know the old man would be proud. It’s been a month since my last post so I thought I’d bring you up to date. Toni has now been in Italy two weeks and is settling in nicely, she loves the city, and the job and everyone is really friendly. On Friday this week me and Patrick will be taking the rest of her stuff out there by car. Fifteen years ago I wouldn’t have thought much of jumping the car and driving for 15 hours straight, however as I get older I am beginning to understand my limitations. So the itinerary is thus. I’m looking forward to the drive and will be re-visiting places I have been to and spent some time at in the past. As expected things are very quiet at home without Toni, but I do keep in touch with her through the half a dozen apps at our disposal, but its not the same. Toni has lined up some places for us to eat next weekend and from what she tells me you can’t really go wrong. This week saw the club AGM, and I couldn’t be bothered to go, strange really but although I still enjoy the radio and am as active as I can be, I’m really not bothered with club activities. Work is still busy and we are looking at around June for the last bus to roll off the line probably LT800. Well this Sunday saw my 54th birthday come and go, I can’t believe I’m still here. It was a nice quiet weekend and the highlight was the kids coming round for the day and Toni brought with her, her new boyfriend Dan. He’s is a likeable lad and they seem very comfortable together, it’s really good to see Toni so happy. I for one am hoping this is going to last, I think he will keep her feet on the ground, and I also look forward to getting to know him better. I took this with my phone as I came out of Risdens wood. I really wish I had taken my camera. 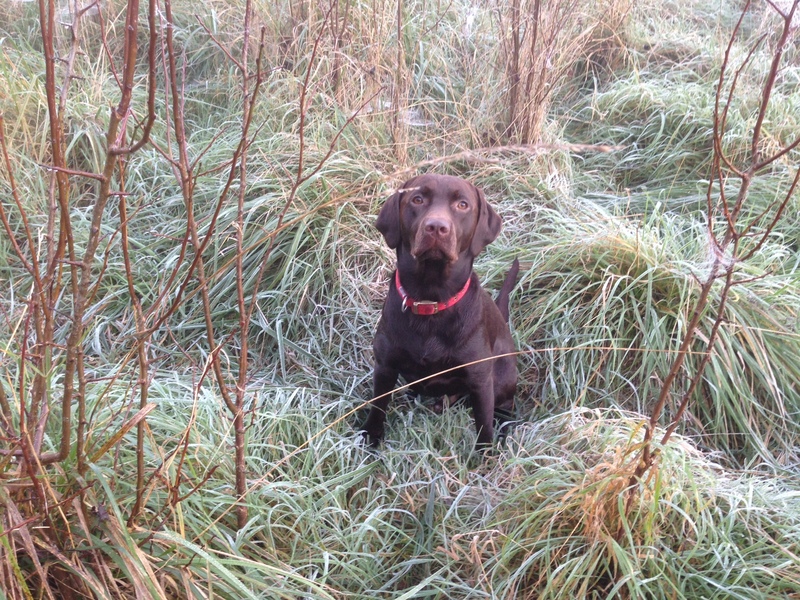 Alfie posing in amongst the frozen scrub. I have now told the club of my intentions not to stand for Vice-Chairman. I intend to do my own thing radio-wise, I will still attend the club, but as and when it suits me. I’m not surprised it ended up this way, it has more to do with me than anything the club has done. The HF bands were very active this weekend and I did hear a few distant stations, unfortunately there was such a pile up I never stood a chance. I’m not really into 599 rubber stamp exchanges but it would have been nice just to be heard on some far off island. Very exciting times at work, I am now setting up another workshop for Wrights and all the grief that goes with that, it’s a headache, but a good one if you can understand that. This week saw my youngest reach the age of 24, I can’t believe the time has gone so quickly. We’re not big on celebration, more’s the pity, in my house so it was a quiet affair. I think she’ll enjoy herself when she goes to Marrakesh in a couple of weeks time. Work keeps on unabated and we are just about to take delivery of the 2nd big batch of Borisbuses destined for Go-Ahead’s Stockwell garage. I have my fingers crossed that the problems encountered on the last batch have been ironed out for this batch. I have just had my annual audit at work and my stock is adrift by the equivalent of the GDP of a medium sized African state. I have spent the last week trying to reconcile the shortfall before I pass it back across to head office. So its a case of watch this space, I’m not confident that I’ll be able to ride this one out. To cap it all, while I was off on Friday, I got a call from my Supervisor to tell me that some pikey’s had blantantly pulled up outside the workshop and stole two brand new bus batteries and drove off. Another £1000 on the stock deficit. My last uncle passed away last week, Uncle Pat, he was married to my Dad’s sister Kath. He was getting on and he had a good life I never went to the funeral, I am struggling with social situations at the moment. I will pop round and see aunt Kath in a couple of weeks time. My Brother Pat went and passed on my apologies for non-attendance. I had a chat with Pat in the week and he just christened his second grand child last Sunday, again I stayed away for the reason mentioned previously. Progress on the shack continues and it is now wired up and one side has the panelling and insulation in place. I think the radio’s will be in by mid September and I am looking forward to operating from the shed again. While working on the shack this weekend my daughter drew my attention to a caterpillar in one of the planters, on closer inspection we spotted about 50 of these, I looked them up and found out they were the larvae of the Large White Catterpillar. This has cheered me up no end. I love wildlife and this has been a sort of validation to the work we have put in on the garden this year, that a wild insect has chosen to lay some eggs in our garden. I think they may have hatched a bit late and I may try to grow some on in captivity if the weather gets worse. CW classses started last week with a change of day to Wednesday instead of Thursday. I am still hovering around 16 wpm and need a kick to increase my speed.